When set to Yes, a Category 1 is required to be chosen during fee posting. It is a Jackrabbit Best Practice to require a Category 1 for each fee posted to allow for revenue reporting by Category 1. For example: "How much did the Tumbling program earn in January?" 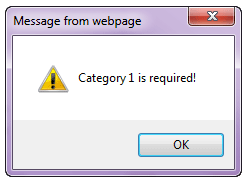 When set to Yes, if a user attempts to post a fee without a Category 1, a pop-up message will advise that a Category 1 is required. The User will not be able to save the transaction until a Category 1 is assigned. Set Prompt for Balance Payoff to Yes to prompt the Jackrabbit User to ask the family to pay their full account balance when accepting a payment with the Save Fee & Pay Now button in the Make Sale/Post Fees window. When Yes is selected the Payment Transaction Entry window will auto-fill the Payment field with the full account balance instead of only the amount of the fee just posted. The User is able to edit the Payment field if Yes is selected in error. Use this setting to determine what order payments are applied to fees as a default when making individual payments (in the Payment Transaction Entry window) or batch ePayments (in Process Credit Cards/Bank Accts). For any payment, fees that are selected by default according to the Apply Payments to setting can be edited by the User in the Payment Transaction Entry screen.